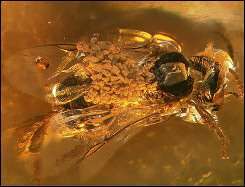 This handout photo from Harvard University shows an amber-preserved stingless bee carrying pollinia of Meliorchis caribea, the first unambiguous fossil orchid known to science. The bee trapped by a glob of sap inside a come-hither orchid up to 20 million years ago has rewritten the evolutionary tale of a flower with the most fanatical following of any plant in the world. Biologists at Harvard University have identified the ancient fossilized remains of a pollen-bearing bee as the first hint of orchids in the fossil record, a find they say suggests orchids are old enough to have co-existed with dinosaurs.